The Birth of the Frito The Kitchen Sisters explore the saga of a Texas corn chip and C.E. Doolin, the can-do visionary behind it. Doolin, who envisioned Fritos as a side dish, never imagined anyone would consume an entire king size bag. The story of the Frito is the latest in the "Hidden Kitchens" series. 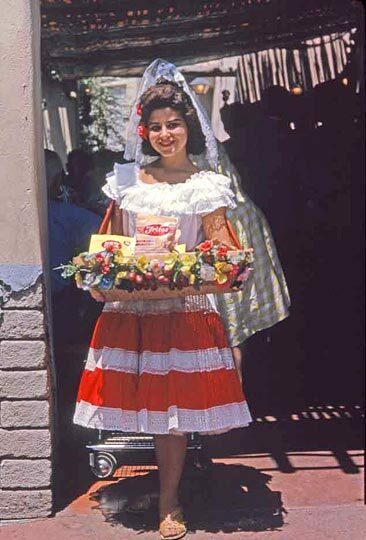 The original Casa De Frito restaurant opened in the Frontierland section of California's Disneyland in August 1955. 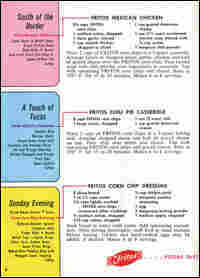 Read recipes for Frito pie, Fritos chili pie casserole, Fritos chocolate crunchies, Fritos squash and fiesta tortilla. 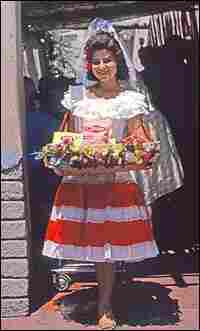 A greeter at the Casa De Frito at Disneyland. 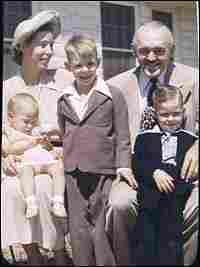 The Doolin Family: Mary Kathryn and Charles Elmer Doolin and their children (from left), Kaleta, Charles and Earl. Dr. Herbert Shelton, a prominent American health educator, vegetarian, and advocate of fasting cures, had many devoted followers, including Fritos creator C.E. Doolin. C.E. Doolin, creator of the Frito and the Cheeto, was a devoted follower of Dr. Herbert Shelton. Shelton was a prominent American health educator, pacifist, vegetarian, and advocate of raw-foodism and fasting cures. 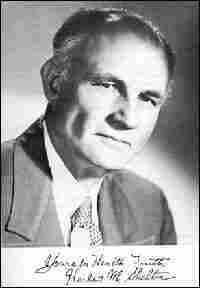 Shelton was nominated by the American Vegetarian Party to run as its candidate for President of the United States in 1956. He saw himself as the champion of original natural hygiene ideas from the 1830s. Doolin attended Shelton's meetings, bringing along his recording equipment to capture the doctor's latest lecture. Doolin also attended Shelton's fasting clinic, the Dr. Shelton Health School in San Antonio. In 1959, C.E. Doolin, impressed with the benefits of his 30-day fast there, gave a $50,000 grant to build a new Shelton school. Doolin wasn't the only one inspired by Shelton's philosophy and regime. Mahatma Gandhi reportedly relied on Shelton's writing about fasting. 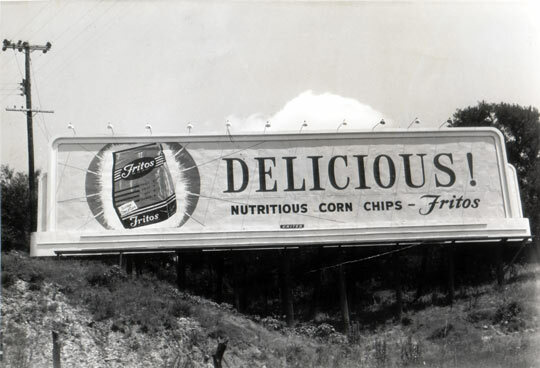 A Fritos billboard photographed by Fritos inventor C.E. Doolin. A Fritos advertising clip rack believed to be designed by C.E. Doolin in the 1940s. 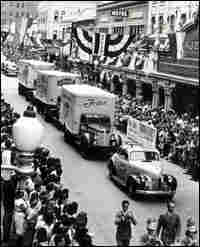 A "Frito Fleet" on parade in San Antonio. A 1958 Fritos recipe pamphlet by "Mother" Doolin, Kaleta Doolin's grandmother. 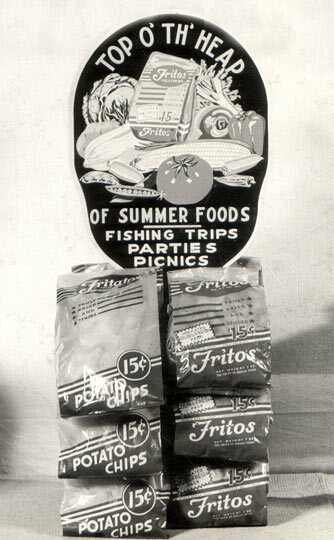 Frito-Lay celebrates the 75th anniversary of the Frito this year. When we produced our 1999 NPR series, "Lost & Found Sound," we said we were chronicling people possessed by sound. 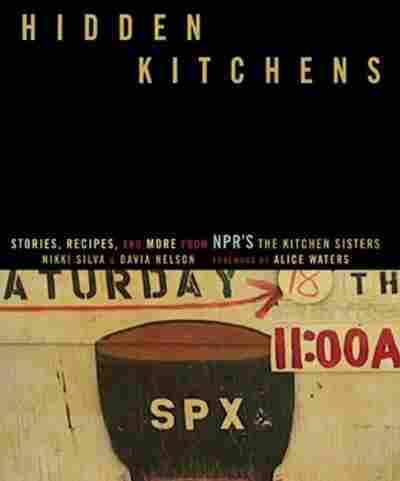 With "Hidden Kitchens," perhaps you could say we are chronicling people possessed by food. Charles Elmer Doolin is one such man. Possessed by a vision. By corn. By creating snack food. Doolin was obsessed with Fritos, his daughter Kaleta said. During the Depression in the 1930s, Doolin had a confectionery in San Antonio. Always an innovator, he got a bug to put some kind of corn snack on his counters. Tortillas staled, so Doolin went on a mission. At a gas station, Doolin found a Mexican man making an extruded corn chip out of masa, frying it and selling little bags of the fried corn chips. They were fritos, "little fried things" — the beach food of Mexico. Doolin bought the patent and 14 customers from the man and began to make the chips in his own kitchen at home, with his mother perfecting his recipe. "His life was one big hidden kitchen," his son-in-law Alan Govenar said. Doolin had kitchens in his factory, kitchens in his lab, kitchens with test tubes and beakers in his house. Kaleta Doolin said his kids were his guinea pigs — helping him test new recipes and flavors. Through these kitchen experiments, C.E. Doolin also invented the Cheeto. Along the way, Doolin started hybridizing his own corn. The secret ingredient in Fritos, Kaleta Doolin says, is her father's own, special corn. He hired farmers throughout Texas to plant his varieties until he found the taste he was looking for. Doolin and his brother Earl were modern, can-do innovative tinkerers. Soon they were taking Henry Ford's idea of the assembly line and conveyor belt and applying it to the manufacture of the Frito. C.E. Doolin had big plans for this chip. 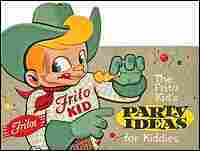 He opened a Casa de Frito restaurant in Disneyland in 1955, and another one in Dallas. The restaurants were a sort of precursor to fast food, a hybrid between hamburgers and Mexican food. 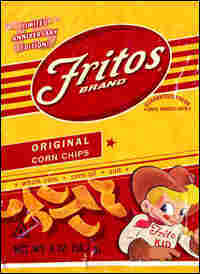 When he invented the Frito, C.E. Doolin imagined them as a side dish, a handful to be served with soup and salad to complement a meal. He never imagined anyone would consume an entire king-size bag. He rarely ate them. And if he brought them home, he would have grabbed them off the conveyor belt before they were salted. The Doolins were vegetarians, and barely touched salt. Kaleta Doolin took figs and yogurt in her lunch to school, not Fritos. In fact, C.E. Doolin was a follower of Dr. Herbert Shelton, a San Antonio vegetarian and healer whose innovative theories on nutrition and fasting permeated the Doolin home. C.E. Doolin, who was overweight and unhealthy and had a bad heart, went to Shelton's clinics several times for 30-day fasts. Doolin ate no meat, no fat, no salt. Shelton, in his heyday, ran for president on the vegetarian ticket in 1956. C.E. Doolin was an early franchiser and soon began distributing Fritos nationwide. 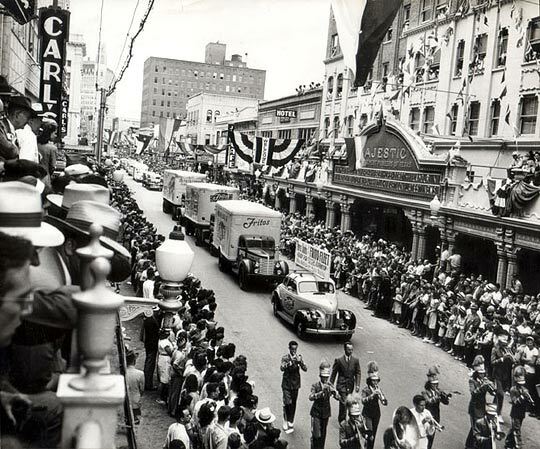 One photo shows a "Frito Fleet" rolling through the streets of San Antonio, accompanied by a local marching band. 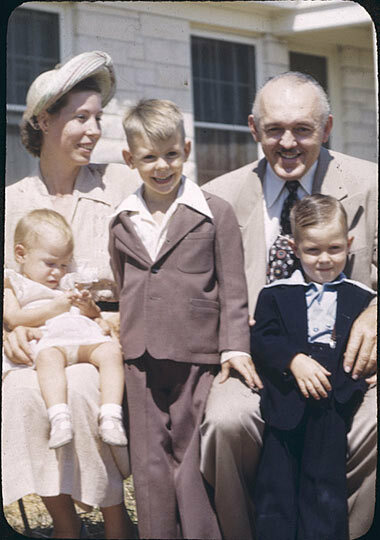 Doolin's wife, Katherine, was known for her social work and good relationships with the workers at the company. 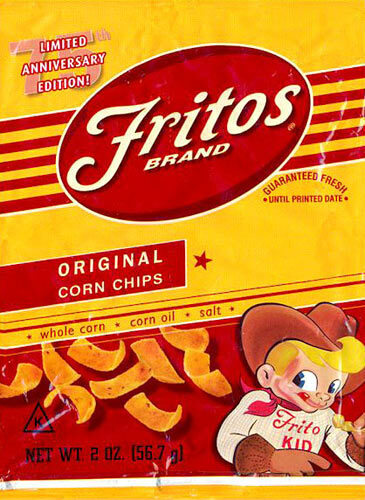 It was a strong, family feeling that made Fritos a legendary Texas business. Mrs. Doolin developed all kinds of recipes using Fritos, including Frito pie and Frito jets (Fritos dipped in chocolate and laid out on a cookie sheet — "fat on top of fat," Kaleta Doolin says). These recipes were printed on the backs of Fritos packages. By the time of his death in 1959, C.E. Doolin had partnered with Herman Lay, and the Frito-Lay brand had gone global. But the company lost that family feeling. We now eat our weight in snack foods instead of the modest portions Doolin had in mind. Kaleta Doolin is busy making a film and writing a book based on the history of her father's groundbreaking work. We thank all in the Doolin Family who helped us tell this story, and Frito-Lay, which so generously shared its sound and images with The Kitchen Sisters and "Hidden Kitchens." Next month on "Hidden Kitchens": The story of a kitchen tradition that goes back more than 1,000 years — Banging the Branch, the olive oil harvest on the West Bank. We were in Dallas, recording at Fuel City, a gas station with a taco stand, 26 pumps, a herd of longhorn cattle, and a swimming pool with bikini-clad pool models waving to the truckers as they passed by. It was a story we were gathering for Hidden Kitchens Texas, our hourlong special, narrated by Willie Nelson, with Robin Wright Penn (her mother was a Mary Kay Cosmetics saleswoman in Dallas). Night came. We were strangers in a strange land. Where to go? Our pal Chris Strachwitz, the founder of Arhoolie Records, had told us to call his pal, Alan Govenar, founder of Documentary Arts in Dallas. Probably half of the music you hear in the "Hidden Kitchens" stories comes from Arhoolie. We call it the hidden kitchen of music. Chris has been documenting secret, below-the-radar, community music all over this noisy nation for some 40 years — sacred steel, gospel, mariachi, zydeco, gypsy, nortena, the blues. You name it, Chris has gone and lived in these communities and recorded their singers and songs. It's a treasure trove, and it seems to fit our stories, hand in glove. We called. Alan invited us to his archive. Inviting us to an archive? How did he know an archive is our idea of heaven? There is nothing we like more than rustling through the well-preserved past and finding shards of sound that inspire and pepper our stories. The Kitchen Sisters — producers of three archival audio collaborations: "Lost & Found Sound," "The Sonic Memorial Project" and "Hidden Kitchens" — were floored. He showed us photographs, films, recordings, shelves, preservation techniques. We were high as kites. When Kaleta Doolin, Alan's wife, joined us for a dinner of barbecue and pie, the four of us were becoming fast friends. We talked about hidden kitchens and the kinds of stories and music we were collecting. After the ribs, they brought us to Kaleta's archive. Kaleta is an artist, filmmaker, community activist and Texan. Around midnight, she began to tell us about her family. 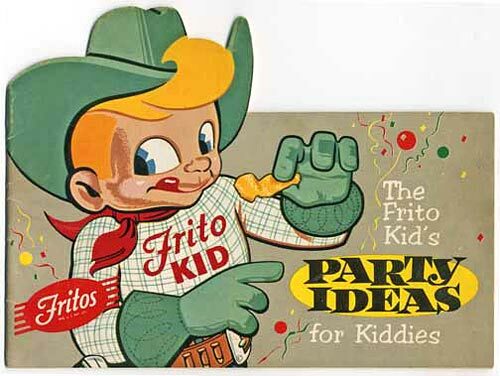 Her father, it seemed, had invented the Frito. According to corporate lore, Fritos founder Charles Elmer Doolin's mother, Daisy Doolin, invented the immortal Frito pie not long after her boys created Fritos. At its heart, Frito pie is a simple concoction. In its primal form, even a child could make it. Like this: Heat a can of Wolf Brand Chili with beef, then take a small bag of Fritos, slit the bag open, and pour chili on top of the Fritos. 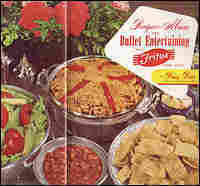 Then eat it with a spoon right out of the bag as you walk around the State Fair of Texas or wherever you happen to be. Some people pile on sour cream or jalapenos, too, although that begins to be something of a burden for one little Frito bag to bear. You might even have to move the bag to a plate. Place 2 cups of Fritos corn chips in a 2-quart baking dish. Arrange chopped onion and half of the grated cheese on top. Pour chili over onion and cheese. Top with remaining Fritos corn chips and grated cheese. Bake at 350 degrees for 15-20 minutes. 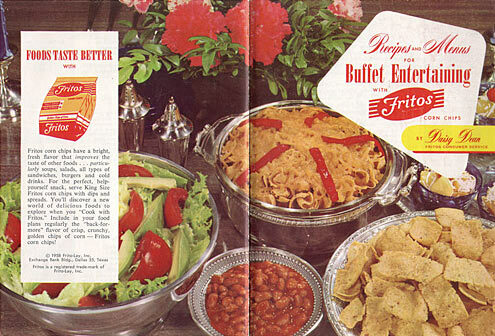 This is one of Kaleta Doolin's favorite recipes from the original Fritos brochure. Saute chopped onion in small amount of butter or margarine. Slice and steam squash in small amount of water and season to taste. Spread layer of squash and chopped onion in casserole and cover with a layer of equal mixture of breadcrumbs and crushed Fritos. Repeat this procedure, making four layers. Make white sauce, using 1/2 cup milk, 1 tablespoon butter, and 1 tablespoon flour. Pour white sauce over the squash mixture and allow to penetrate. Cover top with layer of whole Fritos. Bake in a medium hot oven (375 degrees) for 20-30 minutes. Blend chilies and sour cream in a blender. Layer chips/cream/cheese two times. Pour 1/2 can of chicken stock or vegetarian stock over the entire layered casserole. Put in 350-degree oven and cook for about 15 minutes. Pour remaining stock over the casserole. Bake for another 15-30 minutes. Should be bubbly and brown when done. Cool slightly before serving. Cut into large squares, or cut into small bite size 2-inch squares and serve as an appetizer.